So happy with our combined book we put together has been published on iTunes. 1. Boys wrote their blog posts on their blogs as usual. 2. I copied and pasted the text into one Google Doc and we all looked at it to make sure it was what we wanted to publish. 3. Boys illustrated their texts with hand-drawn illustrations to help personalise the book. 4. I copied and pasted the text into separate pages of a Book Creator book. If we had had more time it would have been better if we had copied and made our own pages but I wanted to crack into it as a proof on concept. That can be our next step for next time. 5. Boys recorded themselves reading their stories into the app. 6. As I had already created an Apple iTunes Connect Account there was no problem there and Apple iTunes Producer has been updated to make it even easier to upload books the job was easily completed. Book Creator has already put together three handy tutorials to help you publish your own books. 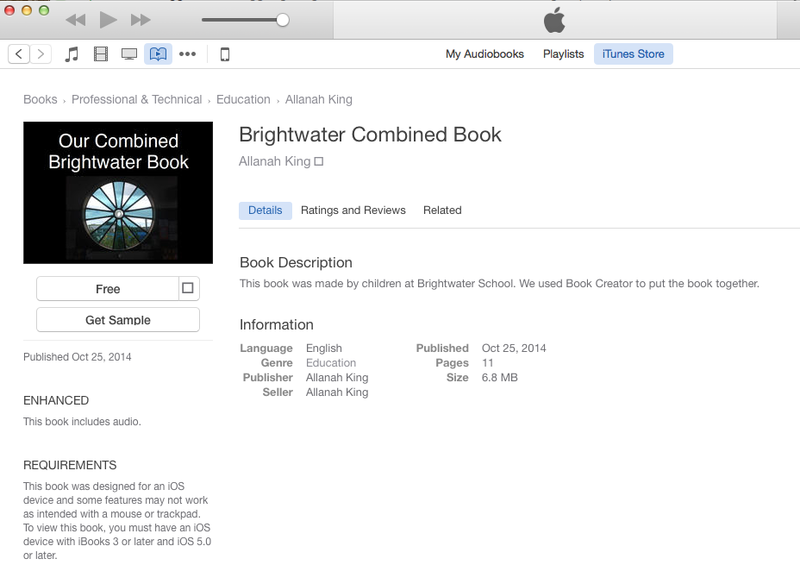 And now the book is published on iTunes- you can search for it by looking for Allanah King or Brightwater, or the link is right here! !